Overview of phyllosphere microbial communities found on 14 different greenhouse plants on phylum level. The plant microbiome is a key determinant of plant health. Less is known about the phyllosphere microbiota and its driving factors in built environments. To study the variability of the microbiome in relation to plant genotype and climate under different controlled conditions, we investigated 14 phylogenetically diverse plant species grown in the greenhouses of the Botanical Garden in Graz (Austria). All investigated plants showed specific bacterial abundances of up to 106 CFU cmâˆ’2 on their leaves. Bacterial diversity (H’: 2.4 — 7.9) and number of putative OTUs (461 – 2013) were strongly plant species-dependent. 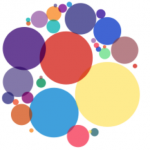 (…) Data of structure and function was linked: frequently isolated VOCs producers (e.g. Bacillus and Stenotrophomonas) were highly present in phyllosphere communities, which were dominated by members of Firmicutes. This study indicates that indoor ornamentals feature a distinct, stable microbiota on leaves irrespective of the indoor climate. Fungal growth in indoor environments is associated with many negative health effects. Many studies focus on brown- and white-rot fungi and their effect on wood, but there is none that reveals the influence of soft-rot fungi, such as Stachybotrys spp. and Chaetomium spp., on the structure of building materials such as plywood and gypsum wallboard. 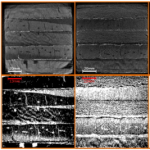 This study focuses on using micro-computed tomography (microCT) to investigate changes of the structure of plywood and gypsum wallboard during fungal degradation by S. chartarum and C. globosum. (…) This paper suggests that the mycelium distribution within building materials and the structural changes, caused by dampness and fungal growth, depend on the type of the material. 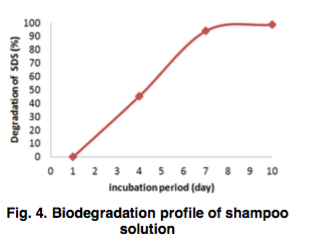 The present study investigated the biodegradation of Sodium dodecyl sulphate (SDS) and Methyl paraben (MP) both in Shampoo and Hair dressing salon wastewater using bacteria isolated from sewage treatment sludge. 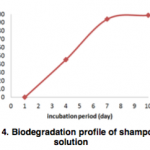 The biodegradation was carried out according to the OECD Guideline for ready biodegradability and was monitored by standard spectrophotometric methods. The results obtained indicated that these compounds were degraded biotically by simple bacteria identified using a Microgen Kit for bacteria characterization. (…) In conclusion, the results of this study suggested that this method of biodegradation of surfactant is cost effective and using bacteria as a biodegradation agent is environmently friendly. New scientific work reveals that microorganisms die when they get trapped in paper fibers and die due to a lack of water and nutrients. 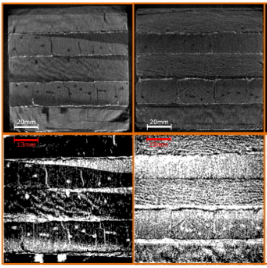 (…) Scanning electron microscope (SEM) images showed that after a few hours the superficial contamination on corrugated surfaces was much lower than on plastic materials. 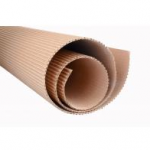 Corrugated surfaces were able to entrap the microbial cells within their fibers. Once the cells were trapped, researchers observed how they underwent lysis: their cell walls and membrane ruptured, the cytoplasm leaked, and the cell disintegrated. This phenomenon occurred in all the studied target microorganisms, both pathogenic and spoilage. Chemical disinfectants are widely advocated to reduce the microbial contamination in dental unit waterlines (DUWL). However, until now their efficacy has been poorly examined after long-term application. In this study, through quantitative PCR and high-throughput sequencing, both bacterial and fungal communities were profiled from 8—12 year-old DUWL treated with disinfectants commonly used by European dentists. (…) Despite disinfecting treatment combined to flushing process, the microbial contamination remained relevant in the studied output water, in association with a high bacterial and fungal diversity. The occurrence of potentially pathogenic microorganisms in these treated DUWL demonstrated a potential infectious risk for both patients and dental staff. A disinfectant shock before a prolonged stagnation period could limit the microbial proliferation inside DUWL. Necessity to proceed to regular water quality control of DUWL was highlighted. (…) The underground coal mine fire in Centralia, Pennsylvania has been burning since 1962 and severely alters the overlying surface soils by elevating temperatures and depositing coal combustion pollutants. As the fire burns along the coal seams to disturb new soils, previously disturbed soils return to ambient temperatures, resulting in a chronosequence of fire impact. 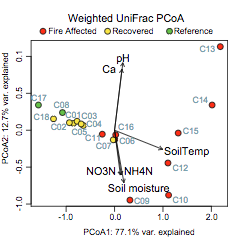 We used 16S rRNA gene sequencing to investigate bacterial and archaeal soil community responses along two active fire fronts in Centralia, and investigated the influences of assembly processes (selection, dispersal and drift) on community outcomes. The hottest soils harbored the most variable and divergent communities, despite their reduced diversity. Recovered soils converged toward similar community structures, demonstrating resilience within 10-20 years and exhibiting near-complete return to reference communities. Measured soil properties (selection), local dispersal, and neutral community assembly models could not explain the divergences of communities observed at temperature extremes. We hypothesize that transitions between the seed bank and the active community, which would manifest as drift processes, are key in explaining these divergences. 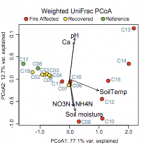 These results suggest that soils generally have an intrinsic capacity for robustness to varied disturbances, even to press disturbances considered to be “extreme”, compounded, or incongruent with natural conditions.